Are you a karachite? Then try keeping your city clean, Karachi along two more cities is internationally known as polluted cities of the world. Where it is said that cleanliness is the part of faith we Pakistanis believe it otherwise. 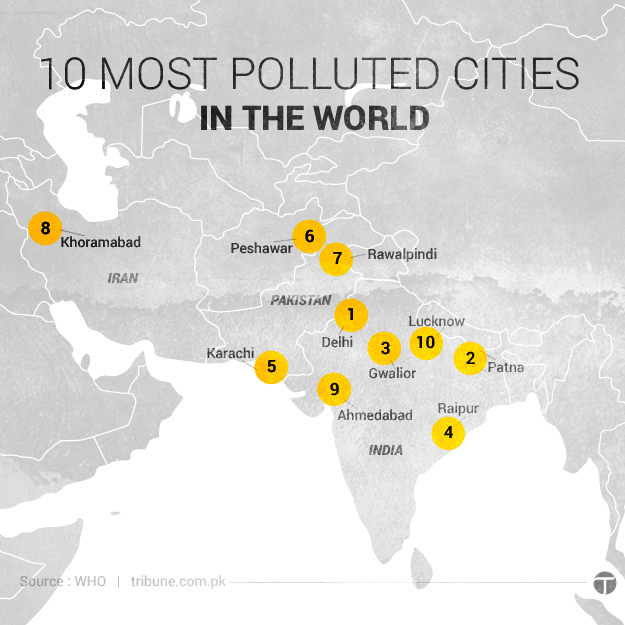 That is the reason Pakistan;s three cities are among most polluted cities of the world. Karachi, Peshawar and Rawalpindi are among the 20 most polluted cities in the world, as per the most recent statistics from the World Health Organisation (WHO) compiled from more than 1,600 cities for the years 2008 to 2013. Good thing is we have not topped in the list and that is our very own neighbor India. Delhi comes first in the race; while Karachi ranks number five just ahead of Peshawar and Rawalpindi which stand at six and seven in the list of 20 most polluted cities. The WHO report listed 1,600 cities in 91 countries and ranked them according to the quality of their air which is measured for concentrations of PM10 and PM2.5 that is particles smaller than 10 or 2.5 microns which are harmful toxins that can cling to the lungs and cause diseases. Interestingly, 13 of the 20 cities on the list are Indian. Delhi followed by Patna, Gwalior and Raipur are in toppers of most polluted ones. The report is a cause of serious health concerns for the inhabitants of the respective cities as toxic pollution hugely impacts human health and can cause acids rains, heart disease and respiratory problems among others. What is the future of our generations in these cities is quite questionable and of great concern. Karachi is a metropolis and it's government should also think about the city. Rawalpindi had been already listed as a dirty one as well and that is not new for it. Sad part is it still remains in the list.